This spot balm takes care of red, blotchy blemishes left behind by pimples and at the same time, it forms a protective film on the skin and cares for your troubled skin. It contains salicylic acid, madecassoside and tea tree oil to treat and prevent the occurrence of pimples. It has a 6-FREE system — Free of animal ingredients, mineral oil, imidazolidinyl urea, triethanolamine, tar coloring and artificial fragrances. 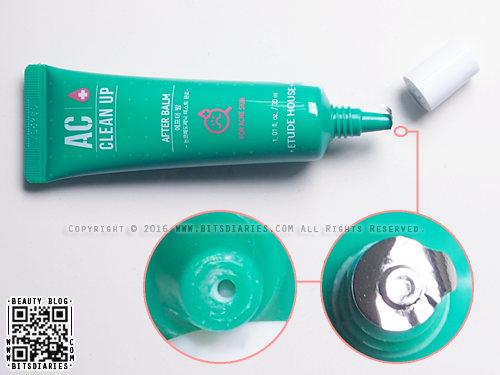 The new version comes in a squeezable soft tube with a twist off cap. Compared to the previous version which comes in a jar that needs a spatula to scoop out the product, this is more convenient and hygienic. Apply an appropriate amount (a thin layer) on blemishes. This has a lighter, softer creamy consistency compared to the former version. It tends to leave a slight balmy residue after applying it on the skin, but it isn't greasy. The redness of my acne marks/scars subsidized after two weeks of using it. And after a month of constant use, the marks/scars were pretty much faded away. So far I'm quite impressed with the results, and I'm glad that it didn't irritate my skin or trigger an outbreak. P.S. I only tried this product on post inflammatory hyperpigmentation. For your information, I don't have severe acne marks/scars, so I'm not sure if it helps severe acne marks/scars. I noticed it works better on newer marks/scars than old ones. Well, it still works to fade old marks/scars eventually, but it may take longer time. So take note that the healing time varies depending on the age and types of acne scars. Overall, it lives up to what it claims to do. If you are looking for a topical treatment for post acne marks/scars, this is not a bad choice. However, you do need to be consistent and patient while using it. Remember, healing is a process, which means it takes time. So whatever treatment you use to treat your acne, don't expect results overnight. Hi. I just want to know when will be the best time i should apply the after balm? Is it good for morning before applying make up or at night before bed time?